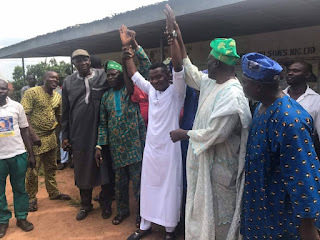 Prince kehinde Alex Bankole has emerged as the house of Assembly candidate of Peoples Democratic Party in Oke Ero Local Government, kwara State. Hon. Kehinde polled 121 votes by affirmation to return consensus as the party's flagbearer in the 2019 house of Assembly election Oke Ero. In his acceptance speech, Alex kehinde Bankole( KAB ) Thanks the senate President Dr Bukola Saraki for the privilege and appreciated all the party leaders excos,delegates and members for the opportunities given to him,he promised to repay the trust reposed on him by the members of the party,he assured them of good representative with integrity sincerity of purpose in the House of Assembly. Among those that lift his hands after the affirmations are the senatorial chairman Mr Ebun Afolayan, Hon J N Olaniyan, Chief Niyi Honeymoon.